Discussion in 'Gadgets & Gear' started by Kaizen1, Apr 5, 2010. I try to carry the minimum amount of crap, too many years of being saddled with a 12 pound duty belt. Half of you ever fell into water ,you'd go to the bottom. 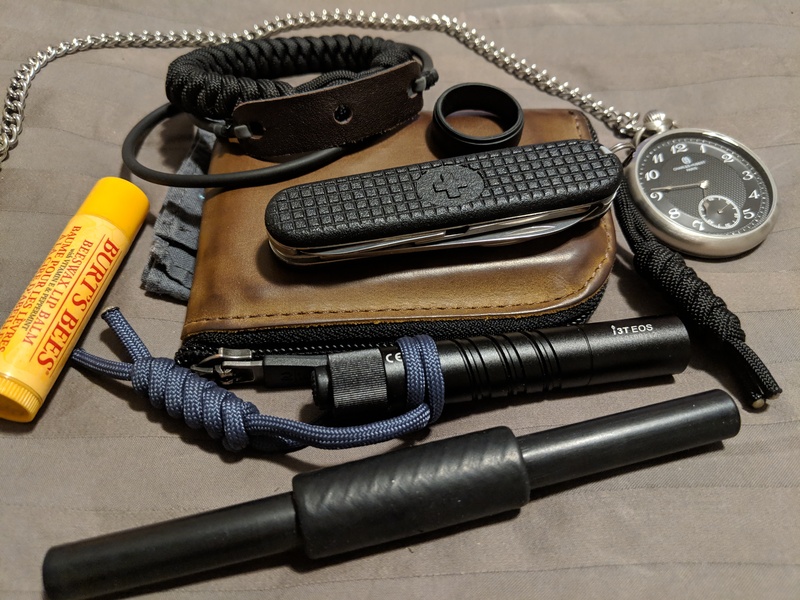 I carry my EDC stuff in a small cordura, tool pouch. My "man purse". If I need something I take it out and toss it in my pocket. Nice and simple while working around the house today. microbe, ErocSD and PeaceInOurTime like this. microbe, TFBraden and ty_higg like this. Got a new light today. Has a little more output than the smaller version (600 to 1000 lumens). microbe, TFBraden, gotgoat and 2 others like this. Got a new light this weekend. I decided to give Olight another shot and this S2R baton 2 is actually pretty sweet. microbe, TFBraden, HwangJino and 1 other person like this. TFBraden, HwangJino and PeaceInOurTime like this. What was the reason you didn’t like the first Olight? I couldn’t stand mine. I hates pretty much everything about my Olight! so much hype. This is technically my third olight but only had problems with 1. I have one of the original M10 Mavericks when they first came out and that one is great; absolutely no complaints a real beast of a light and I wish they still made it. The second one I had was the S1R when they first came out with the rechargeable back, and I broke it within two weeks. I don't abuse my gear by any means but I am fairly hard on it but it still shouldn't have broken. I also think they try to do way to much with that light to please the social media people looking for likes. A small single CR123 pushing 1000 lumens is just crazy and not necessary (HYPE). So after that I switched over to Fenix primarily and have had zero problems with any of their lights at all. I only decided to get the S2R 2 because I thought maybe my last experience was a fluke, and the moonlight-high modes are about perfect for what I like with a good temperature. With low being 15, medium at 120, and high at 400 lumens that's all I need day to day and I could care less about "Turbo" because I have never needed 1,150 lumens. But... we will see if it lasts I really hope it does but I have my suspicions from my last experience. A.L. and gotgoat like this. A.L. and ty_higg like this. I have an Olight M20SX Warrior and it's been a great light but I have a ton of other lights for 95% of what I need a light for. My favorites are single CR123a lights. I use LiFePo4 rechargeables for them. For Olights, I have a S10 baton (cr123a), T10 (cr123a), T15 (AA) and T25 (2xAA). The T25 is my truck light and I swap the batteries every year or so. 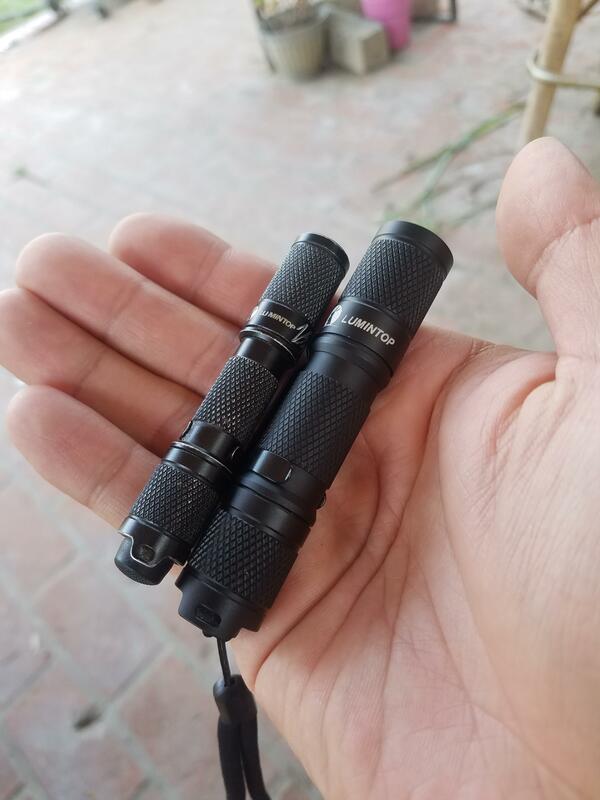 I used to carry i3 EOS AAA lights (ITP A3 EOS before Olight bought them) on my keychain (80 lumens) but I switched to a Nitecore Tip. I love my M2 warrior and my Warrior X. Dont have any problems with mine. I'd contact Olight and see if they'll fix any issues that could have arisen. My M10 maverick has been an amazing light that I've had for 5 or 6 years. It's done way more than I would expect a light to do and I still use it everyday around my apartment with a baton/diffuser on the front of it for reading at night. I'm sure my incident with my S1R was a fluke but I have been a little put off by magnetically charged lights since then because that's were the issues arose. I had planed on sending it to olight to see if they would of been able to fix the problem, but when I moved shortly after I lost the light. My issue was probably a fluke but the magnetic charging lights still bring me to question buying them. I even have a small AAA Fenix light I carry a lot that used magnetic charging primarily and I broke that feature/function the first day I got it. But I could still charge it on my stand alone battery charger thankfully. And to keep the thread on track here is my carry for today! microbe, TFBraden, HwangJino and 2 others like this. Mine today, and most days. Fairly consistent, I don't mix it up too much anymore. microbe, HwangJino, PeaceInOurTime and 1 other person like this. What's the doohickey at the bottom of the pic? It's a yawara stick made from delrin. It's a trainer model for the titanium ones, but I like the lighter weight in the pocket. Much easier to carry around. Boxer .45 and knarfeng like this. 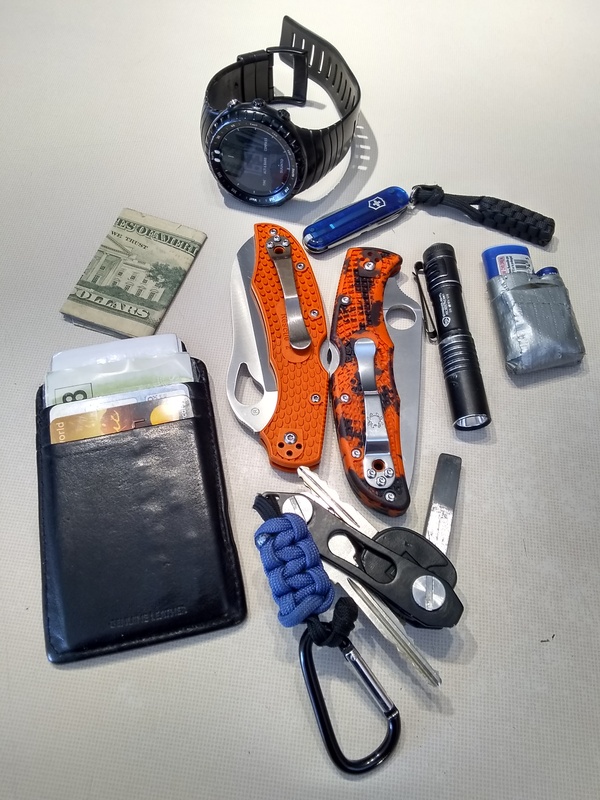 I only recently became interested enough to spend much on a knife or other edc items. The knife I have is a Gerber Outrigger. I dont know if it counts but I also got the jackknife lock pick. I got a big head too so I guess we could say I'm "edc"ing that thing too. Haha. TFBraden, PeaceInOurTime and ErocSD like this.